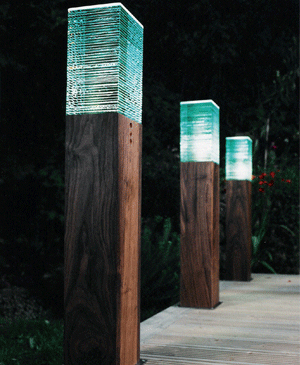 This is the latest exterior and interior lighting range from Gwyn Carless. 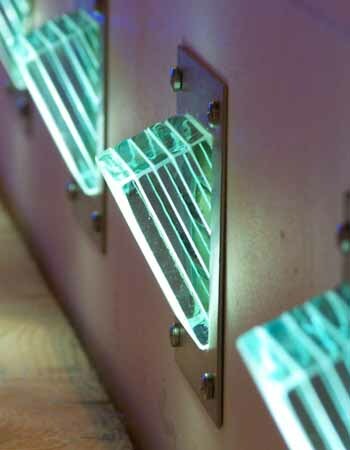 All the lights are hand made to the highest standards. 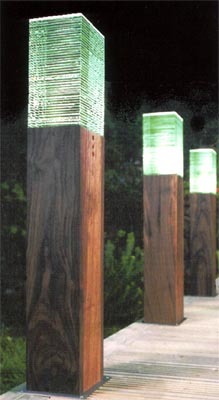 The latest technology and the beauty of traditional materials have been blended to create a unique design led collection of exterior and interior lighting. 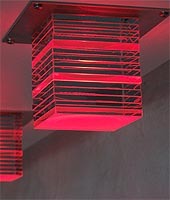 The lighting range can be adapted to suit your requirements. 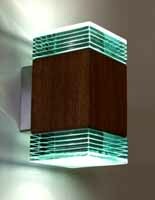 Special versions of each light can be ordered, for example using coloured LEDs, opti white glass, different timbers or bespoke sizes. Some examples of recent larger bespoke projects can be found below. 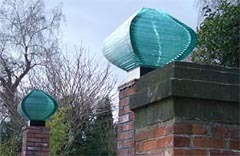 All lights are made to order in the workshop in Derbyshire. 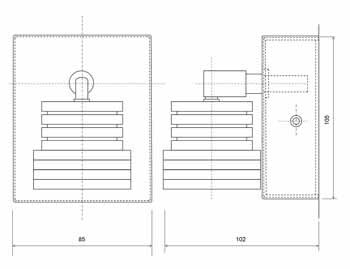 This 740mm Bollard is ideal for driveways, walkways, car parks, etc. 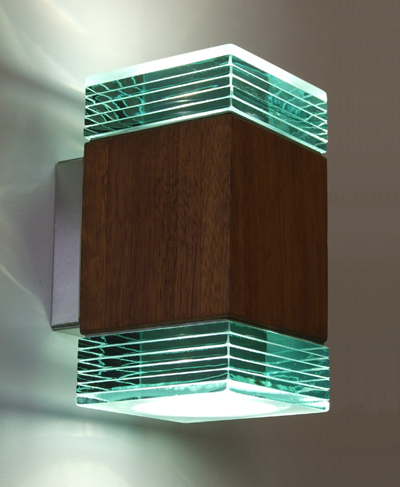 One of the most popular lights in our range. Construction is of laminated glass mounted on an oiled hardwood column (Solid Iroko) with a stainless steel base. 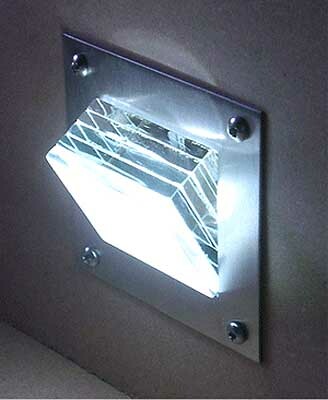 The glass is elongated and illuminated by one 4.5watt high power LED. 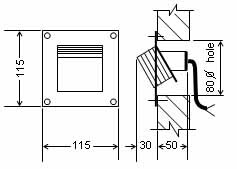 The Bollard comes complete with a stainless steel mounting plate. Other timbers available on request. This very popular bollard light is constructed of laminated glass mounted on an oiled hardwood column (Solid Iroko). The glass is illuminated by one 4.5watt high power LED and a stainless steel plate fixed to column base allows for easy installation. 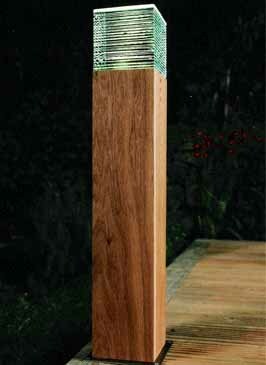 This Iroko Hardwood Bollard is ideal for driveways, walkways, car parks, etc. 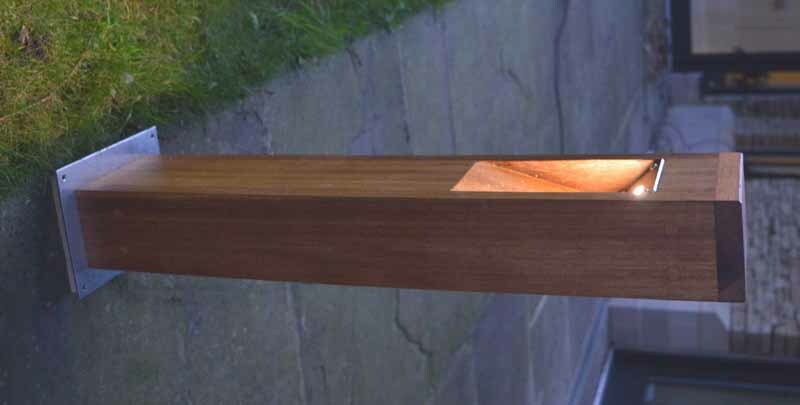 This laminated hardwood bollard comes with a 4.5watt Luxeon M LED mounted within the bollard on a 4mm glass plate bonded to a 3mm 304 stainless steel cover. 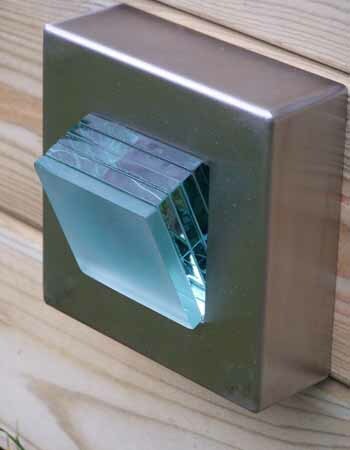 It is fitted with a pre drilled stainless steel base plate ready for installation. A remote LED driver will be required. Iroko hardwood is supplied as standard but American Oak or Black Walnut are also available on request. 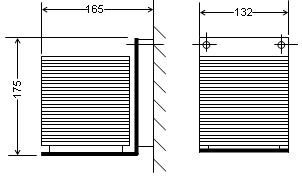 The bollard measures 140mm x 140mm. The prices for three standard sizes are listed below. 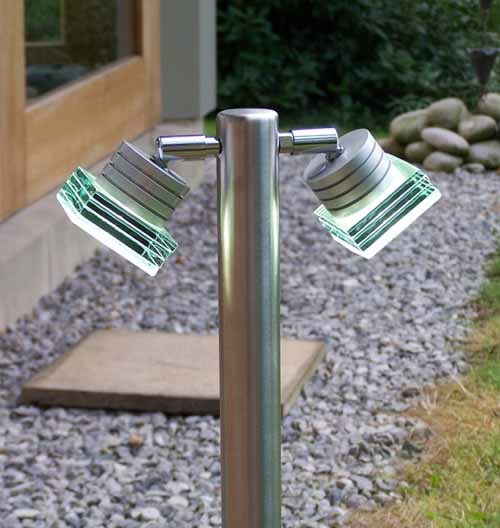 This 500mm Mini Bollard is ideal for gardens, walkways, decking, etc. 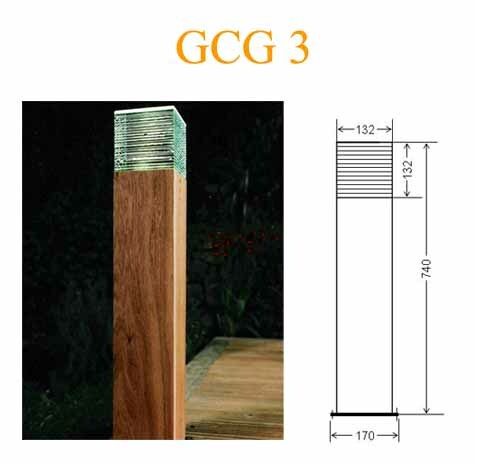 This mini bollard is a more petite version of the GCG 3 and of similar construction (laminated glass mounted on a column of Solid Iroko). 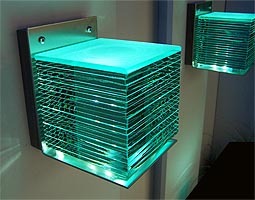 A high power LED illuminates the glass block. Other timbers are available on request. 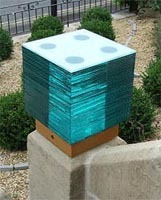 This classic cube is mounted on a stainless steel base and is constructed from laminated glass. 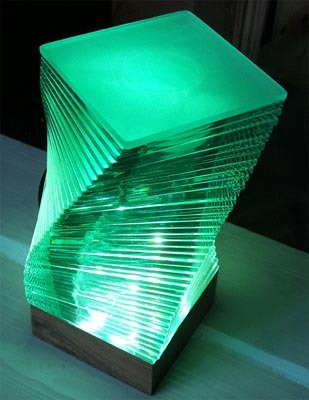 Illuminated by a high power LED it glows brightly enhancing the natural colour of the glass. By default this comes with a 1watt LED. 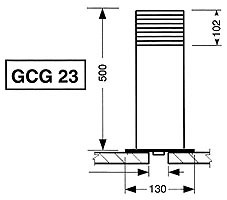 A larger elongated version of the GCG 13 originally designed for mounting on decking, but is equally at home on top of walls or hard paving. 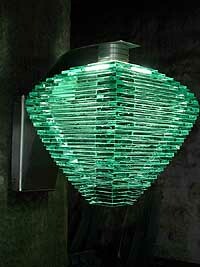 Constructed from laminated glass and stainless steel and illuminated by one 4.5watt high power LED. 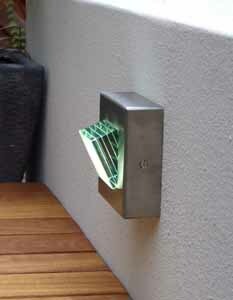 This Wall Light compliments the Bollards as shown above. 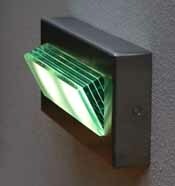 This wall light is designed to compliment both the GCG 3 and GCG 5 bollard lights. 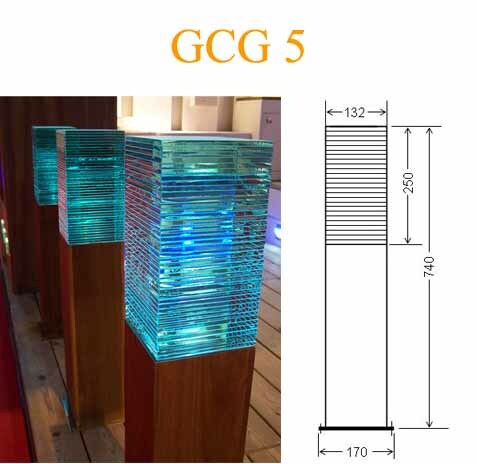 The laminated float glass blocks are bonded to stainless steel plates which are attached to a hardwood base (Solid Iroko). The light is installed via a mounting plate and wall canopy of 2mm stainless steel. 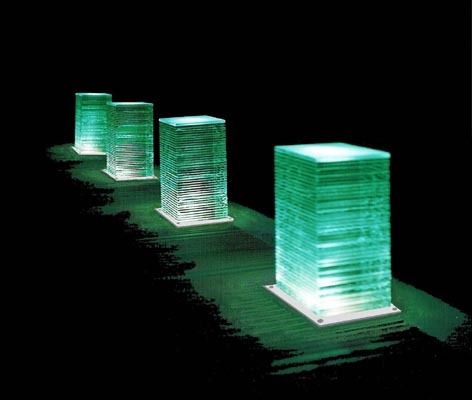 Illumination of the glass blocks is by two 4.5watt high power LEDs. 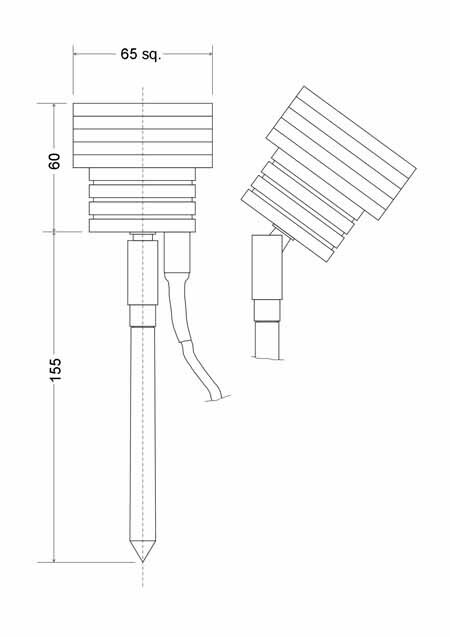 These LEDs are driver by a LED Driver fixed within the hardwood allowing the fitting to be connected direct to a mains supply. 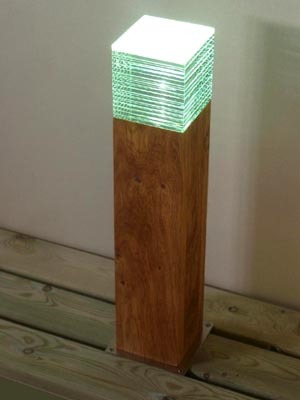 The Iroko timber can be supplied oiled or un-oiled ready for painting to a chosen RAL finish. 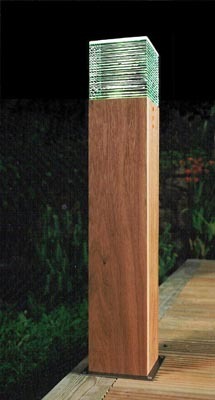 Iroko hardwood is supplied as standard but American Oak or Black Walnut are also available on request. 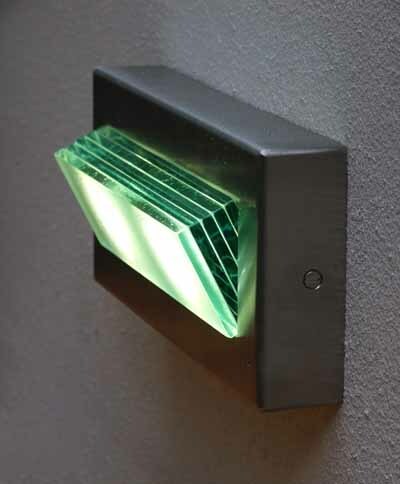 This Wall Light compliments the Bollards above. and oiled hardwood (Solid Iroko). 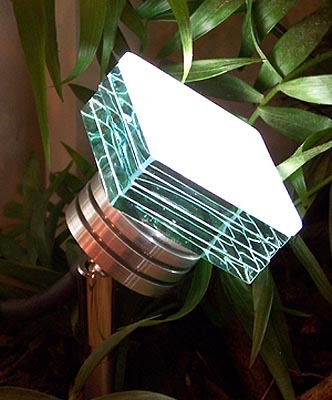 This glowing cube is illuminated by a number of high power LEDs. 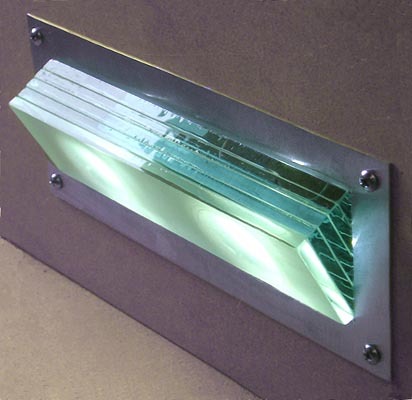 This best seller projects light down onto steps or paths when mounted on a vertical surface. 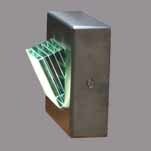 Constructed from stainless steel and laminated glass, it is illuminated by a high power LED. This is a surface mounted version of the GCG 31. 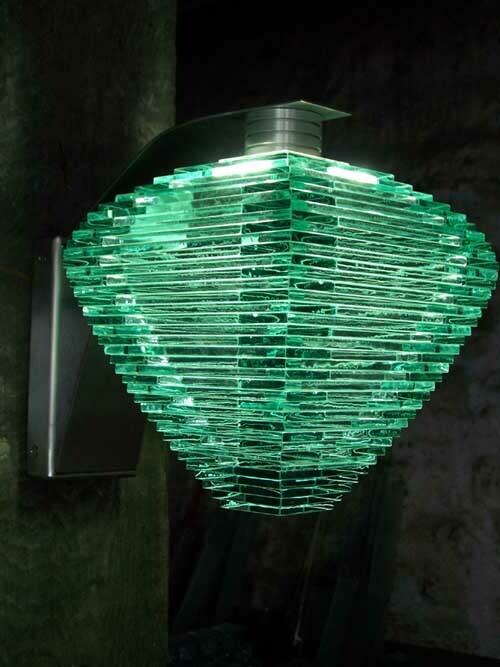 Constructed from stainless steel and laminated glass. It is illuminated by a 1watt high power LED. 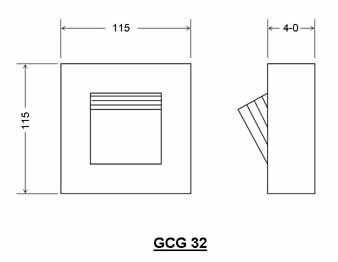 A longer version of the GCG 31 designed to occupy the space of a brick. 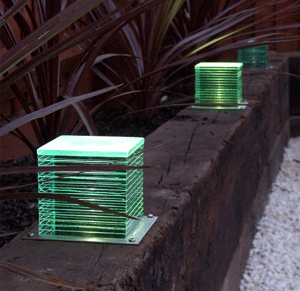 Lit by high power LEDs it provides good illumination to any path or patio. 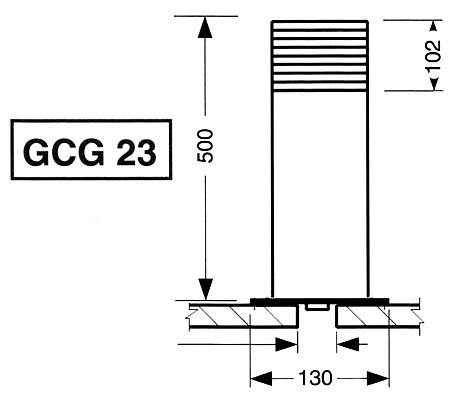 A longer version of the GCG 32 designed to occupy the space of a brick. 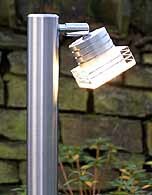 Lit by two high power 1 watt LEDs it provides good illumination to any path or patio. A classic in garden lighting. A laminated glass block is bonded to an anodised aluminium LED housing. This pivots on a chrome bracket which is connected to a stainless steel spike. 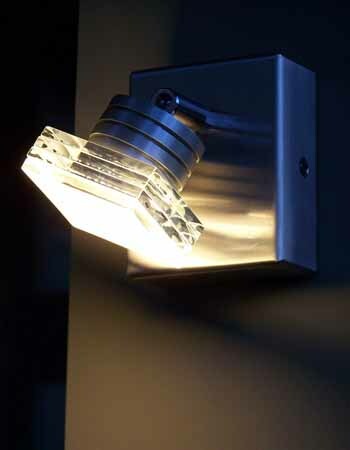 This is a surface mounted fully adjustable wall light. 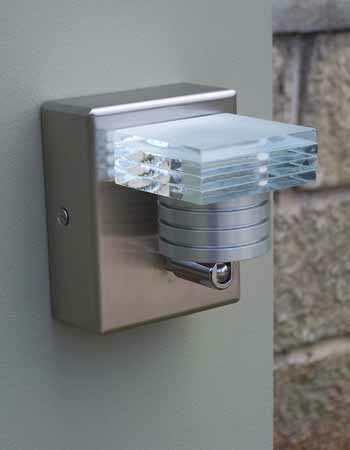 Constructed from aluminium, stainless steel and laminated glass. Available in 1watt or 4.5watt high power LEDs. A Stainless steel post light with fully adjustable head. Constructed with a substantial 38mm tube. 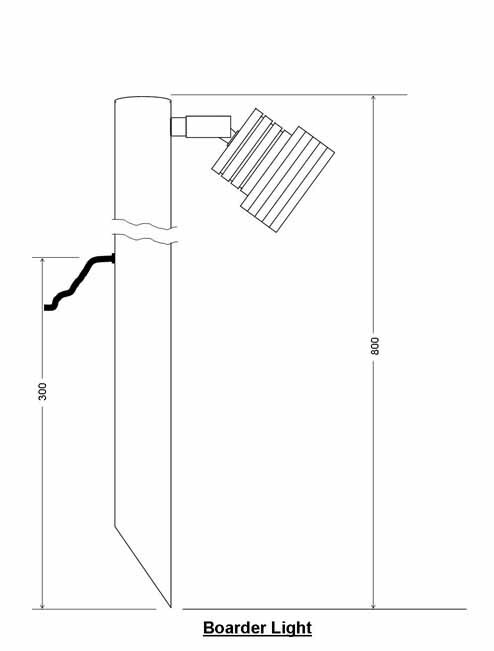 Spiked end for easy installation. Comes with 2 m of HO5 cable and LED driver. 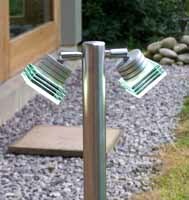 A Stainless steel post light with two fully adjustable heads. Constructed with a substantial 38mm tube. 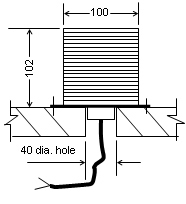 Spiked end for easy installation. 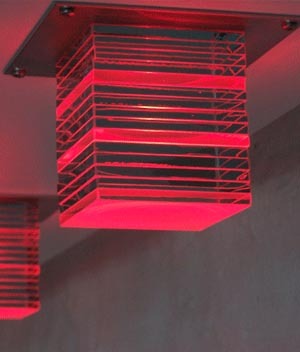 A glass lattice lantern on a stainless steel arm. 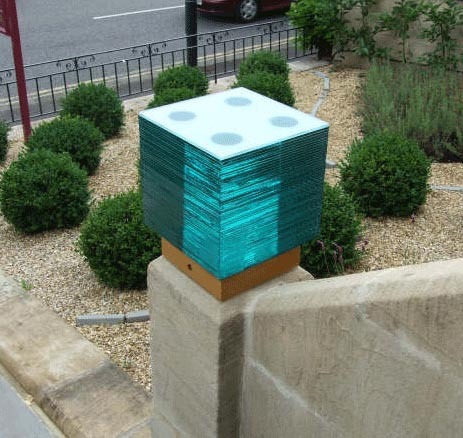 300mm cubes mark the entrance to the Brooks hotel in Bath. in accordance to external temperature changes. 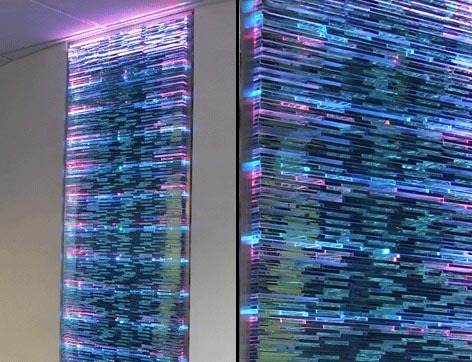 was built using thin strips of glass. Hanging ceiling lights. 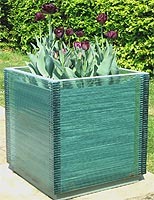 Can be made to suit your requirements.